Iconic restored Ottomon-era station may be open on Shabbat - but rather than protest, a local synagogue is spreading some Hanukkah joy. 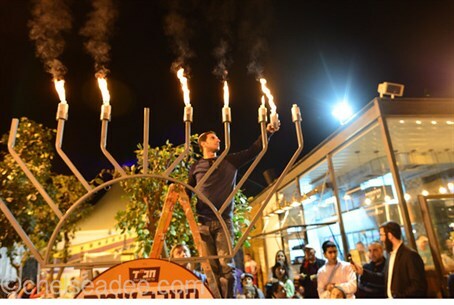 A daily Hanukkah menorah candle lighting ceremony has been taking place every night of Hanukkah at the Tahana Rishona (First Station) complex in Jerusalem. The historic Ottoman train station dating back over 100 years was recently refurbished and opened with restaurants and coffee shops this summer. Controversially - particularly for the city's large hareidi-religious community - although some restaurants are strictly kosher, others are not and are open during Shabbat with music and other outdoor activities. But Rabbi Avraham and Dina Hendel of Beit Levi-Chabad of Baka said that rather then protest, they have chosen to set up a large menorah for the entire community. "There is a spiritual glow this Hanukkah at Tahana Rishona, thanks to daily menorah lightings at 5 p.m., including lively music, dancing, and the distribution of delicious doughnuts," Rabbi Hendel stated. "Jews of all religious affiliations and backgrounds have been invited from the crowd to light the huge menorah and recite the brachot." One of the candle lighting ceremonies was dedicated in memory of local community member Ira Feldman, a immigrant from the United States who died unexpectedly two weeks ago. Another lighting was dedicated in memory of Rabbi Hendel's 13-year-old brother Levi who was killed on Hanukkah in 2006. He and three other Chabad volunteers died in a car crash on the road to Eilat on their way for a volunteer program on an IDF army base to deliver traditional Hanukkah doughnuts and candles, and to help with holiday celebrations. The other volunteers killed in the crash were Yonatan Biton and Moshe Golan. Four other people were injured. Other attractions at the candle lighting ceremony have been fire jugglers and free sufganiot, (jelly donuts). On Monday, a group of wheelchair-bound residents joined in the dance circle. Photo credits: Ben Bresky, Nehama Dina Hendel and Chelsea Dee.